All-on-4® employs an innovative denture system designed to replace an entire row of teeth. Each denture is held securely in place with just four dental implants. These implant supported dentures can replace the teeth of the upper arch, lower arch, or both arches for a full mouth restoration. Since All-on-4® dentures lock into position, there is no need for the messy adhesives or pastes typically associated with dentures. In addition, most patients find that All-on-4® implant supported dentures look and feel more like real teeth. Some patients choose the All-on-4® system as an alternative to a full set of dental implants. Since All-on-4® uses only four dental implants instead of one for every tooth, patients with minimal jawbone density who may not be candidates for dental implants may still be candidates for implant supported dentures. These patients may also avoid the need for a bone graft by choosing All-on-4®. Finally, in some cases, All-on-4® can be a less expensive method of tooth replacement compared to a full set of dental implants. Beginning with a 3D scan of the mouth, our dentists customize each All-on-4® treatment plan to meet the needs of the individual. For each arch of teeth that needs to be replaced, two dental implants are positioned toward the front of the mouth on either side. 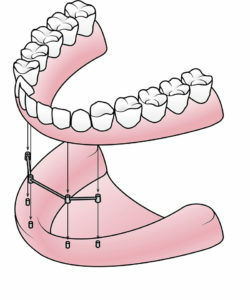 Two additional implants are then placed on either side at the rear of the mouth, angled posteriorly. Over the next few months, these dental implants will fuse to the jawbone for increased stability. In many cases, a temporary fixed denture can be worn during this time before the final restoration is attached. This unique formation of dental implants can provide enhanced stability for the custom denture, keeping it securely in place at all times. Depending upon the structure of the jawbone, some patients may better benefit from six implants per arch rather than four. This variation of the All-on-4® method is commonly referred to as “All-on-6.” During the consultation process, our dentist will perform an oral exam, discuss your goals, and determine which method of tooth replacement can best meet your needs. For more information about All-on-4®, or to schedule a consultation with one of our dentists, please contact us today.